Note: The Gitzo GT1542T Traveler Carbon Fiber Tripod has been replaced by the Gitzo GT1555T Traveler Carbon Fiber Tripod. At review time, I consider the ultimate tripod to be the Gitzo GT3542LS. But, there are times when I need something smaller and/or lighter. And for these times, I need the ultimate "travel" tripod. 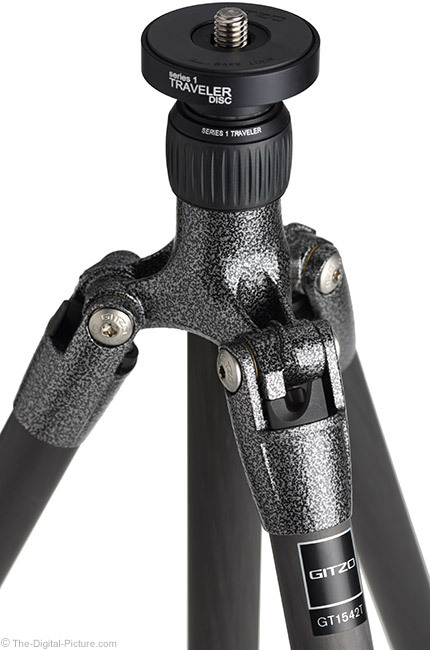 The Gitzo GT1542T Traveler Carbon Fiber Tripod is what I consider to be just that. This is the tripod that best meets my needs when carrying/taking a full size model is not possible or not desirable. The Gitzo GT1542T provides incredible strength and stability in a very small, light and quality-built package. It is an ideal, and perhaps the best, travel tripod and is also a great backup tripod. I most frequently use the "Travel" designated Gitzo tripods when I am (surprise) traveling. While I typically have a full sized tripod with me for primary use (even when traveling), my travel-sized tripod usually gets packed in a separate checked bag to help insure that at least one tripod arrives at my final destination. So, in reality, my travel tripod is most important to me as a backup tripod. Fortunately, I have not needed the backup tripod for that reason yet, but I use both tripods on these trips. At my destination, I am most frequently using the full-sized tripod, but with the optimal sunrise and sunset landscape shooting windows being extremely short and the exposures being time-consuming when the sun is below the horizon (especially with long exposure noise reduction in use), I am often using both tripods simultaneously. Two complete camera systems in live action at these times of the day can give me up to twice as many image captures from a variety of focal lengths, camera settings and subject framings. I often find myself going back and forth between cameras, setting up one camera and tripping the shutter release while the other camera completes an exposure that requires perhaps a minute. And then vice versa. If you consider the cost of travel, it is not hard to justify the cost of a second tripod to considerably increase your take-home. And if my primary tripod failed to arrive at the same destination, I would likely have a very competent tripod waiting for me in the other bag. If my primary tripod became damaged, the travel tripod would be there to take over. Leaving the big tripod at home is another option for those needing to travel very lightly. I also use travel-sized tripods for non-travel uses including hiking and sometimes even trail running. The small size makes travel tripods great for tabletop work as well. I had been using the Gitzo GT1542T Traveler Carbon Fiber Tripod's predecessor, the GT-1541T, for many years. Before I got around to sharing a review of it, the GT1542T was introduced and at that point it didn't make much sense to review a discontinued tripod model that was no longer readily found. Since the Gitzo GT1542T had only minor changes from the already great GT1541T, I found it difficult to finance the upgrade. The breaking point for this upgrade came when a friend wanted my GT1541T for a trip he was leaving for in a couple of days. I relented, sold the GT1541T on short notice and bought the GT1542T. I love getting new gear, but was the upgrade from the Gitzo G1T541T to the GT1542T worth the cost? Ehhh. Maybe not. Is the GT1542T the right travel tripod to buy? Definitely. Perhaps the biggest change in the GT1542T is how the legs fold up. Travel tripods typically have legs with hinges that allow them to be folded 180° completely over the spider/chassis of the tripod for a more-compact size. With the center rapid column fully extended, the GT1541T legs folded completely over the tripod head, meaning that the head needed to be very narrow to not prevent the legs from folding parallel to each other. The GT1542T legs fold up to just under the top plate (as shown below), allowing a larger tripod head sizes to be used. 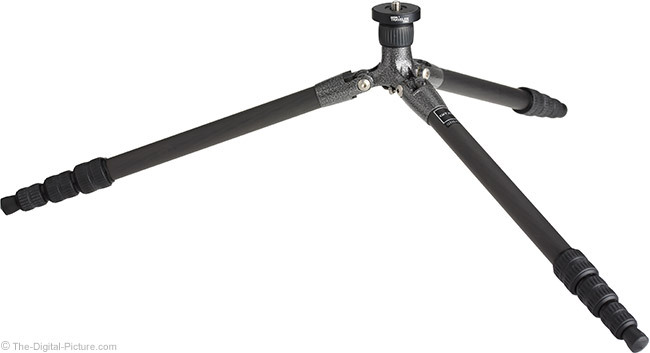 Another new model, the Gitzo GT1544T, has a shorter center column that again becomes surrounded with the folded legs. The GT1544T has a slightly shorter height, slightly higher load capacity and, at review time, a much higher price (nearly $200 USD higher). 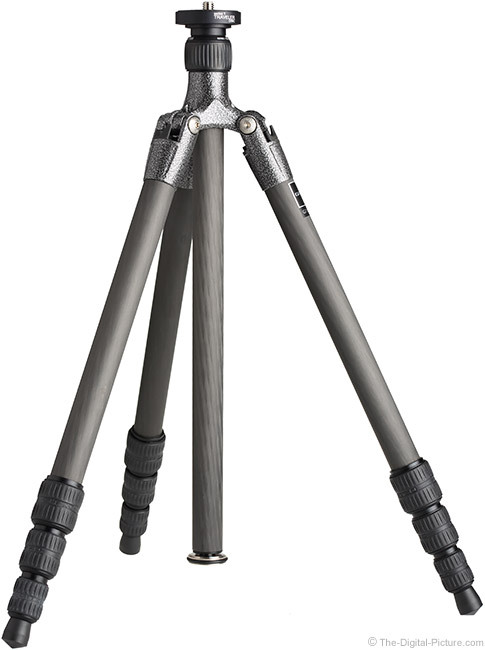 Here is a closer look at the travel tripod specs with a full-sized GT3542LS included. I know that I'm comparing apples to oranges with the full size tripod, but it is helpful to see what you gain or lose with the smaller size. Aside from the smaller size, weight loss is the GT1542T's positive gain over a full size tripod. You can also see some small differences between the GT1541T, GT1542T and GT1544T. I love the Gitzo G1T542T and like it no less than the GT1541T, so making my friend happy was probably worth more than the upgrade cost from the GT1541. "Gitzo 6x guarantees structural strength, flexion rigidity, and great vibration absorption properties. The performance of this multilayer design is unique and inimitable thanks to the advanced aerospace production technology and the exclusive inner structure. It is the highest-density tube that's 100% made of top-quality ultra-thin (7µm) carbon fibers – a 28mm tube contains 1.5 million carbon fibers." Fully extended, this tripod holds my 170 lbs. (77kg) frame without the legs locks slipping or any part breaking. Using my body weight may sound like a strange way to test tripod and tripod leg lock strength (especially when they are rated for about 1/10 of that weight), but ... I always have my weight available and this weight has proven to separate the great tripods from the good ones. Just because it can hold that weight does not mean you should put that much weight on the tripod. Gitzo recommends using this tripod for lenses up to 135mm with 200mm being maximum. I've used lenses as large as the Canon EF 600 f/4 L II IS USM Lens on the fully retracted GT1542, but don't recommend using a lens this large/long as vibrations last a long time and any wind will allow vibrations to continue constantly. With legs fully extended (with the non-rotating center column fully retracted), this tripod easily handles a medium-large-sized 400mm f/5.6 lens and I would not be afraid to use an up to mid-sized (f/5.6-ish) 600mm focal length in good conditions (including no wind). With legs fully retracted, a mounted 600mm f/5.6 lens appears solid in the viewfinder. Of course, wind can change everything. Vibrations with the rapid column extended are much exaggerated and Gitzo's dual recommended maximum focal lengths is perhaps accounting for this issue. Since I don't use the rapid column very often (due to the increased vibrations), I removed it from my GT1542T. The upper disc/top plate section of the tripod simply unscrews (sans tools) from the center column and the small weight hook housing then threads into the upper disc to lock it into place in the spider. The weight savings is only minor and the vibrations are not different from the installed-and-retracted column, but I frequently shoot close to the ground. Due to the center column ground clearance issue, removing the center column is necessary to use the tripod in its lowest shooting position – without reversing the center column and shooting with the camera upside down. As always, your tripod head height must be added to the tripod's height. Also note that with the center column removed, the tripod legs do not fold up tightly into the 180° position due to the width of the upper disc. I usually leave my tripod legs in the more-conventionally folded orientation with removing the top plate and head entirely being a sans-center-column compaction option. The advantages of using the center column are the additional height it provides and the quick height adjustment it makes available (adjusting one rapid column lock is faster than adjusting three leg locks). As this center column is reversible, shooting with an upside down center column can take your DSLR to ground level. With the tripod fully folded as shown above, the spring-loaded counterweight hook is clearly visible. When increased stability is needed, add weight to the tripod via this hook. Visible in the above image is one of the leg angle lock sets. With the leg fully in position, these sets do not move. Pull the leg inward slightly and the spring-loaded lock set can be moved sideways to the center position for the second leg spread lock or slid fully to the right to be folded completely up over the chassis. The leg angle set locks incrementally ratchet into each lock position as the legs are lowered. The image below takes another look at the lower-positioned leg locks in use without the center column in place. The GT1524T's top plate measures 1.7" (43mm) in diameter and the outer top plate surround is 1.96" (50mm). You can select a tripod head that has a base width within either of those dimensions, but as I mentioned before, the legs on this model do not fold over the head. Thus, a head with a larger base can easily be used. 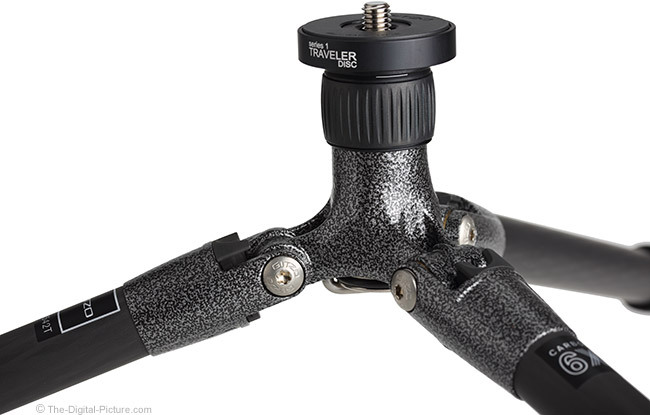 Travel tripod-specific heads typically have a straight side (vs. a flared base) to retain a small diameter. The top plate includes a 1/4"-20 & 3/8"-16 reversible stud for head mounting. 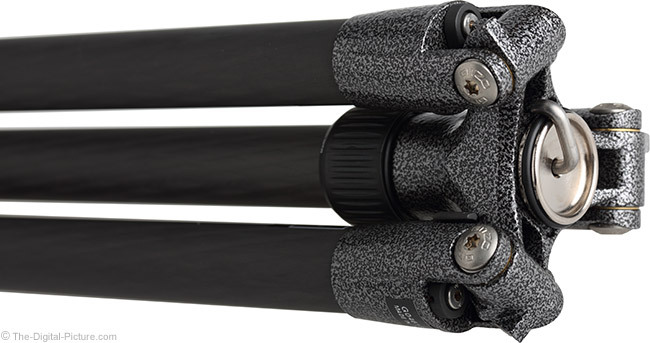 The Gitzo carbon fiber traveler tripods feature fast, laterally rigid and very strong "G-Locks". With a short, roughly 1/8 rotation, these twist locks go from locked tight to fully released and vice versa. As you can visualize from the above image, one hand can twist all three locks on each legs at once to release or tighten the legs in the retracted position. When extended, a short twist of each leg lock will tighten or release the locks. G-Locks can be tightened and released in any order. If moving quickly, it takes me 15 seconds to take the tripod from folded and retracted to fully extended and ready shoot. Tear-down time is the same. Add a couple of seconds if the legs are folded to the 180° position. This is a great looking tripod, and as shown above, Gitzo provides a bag for dust and minor scratch protection. If you need a small and light tripod but do not want to give up quality, strength and rigidity, I highly recommend the impressive Gitzo GT1542T Traveler Carbon Fiber Tripod. While this is a modestly-high-priced tripod, it performs as well as or better than some good quality full-sized tripods in the same price range.